May also contain peanuts, nuts, sesame, egg and soybean. Ingredients: Corn Flour (39%), Vegetable Oil (Palm Oil), Wheat Flour (Gluten) (20%), Rice, Sugar, Salt, Flavouring, Flavour Enhancer (E621), Colour (E170), Emulsifier (E471), Antioxidant (E319). 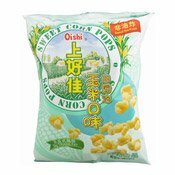 Simply enter your details below and we will send you an e-mail when “Sweet Corn Puffs (上好佳玉米泡芙)” is back in stock!